Chaplain Colonel John Schumacher (Retired) and his wife, Martha, joined Larry and Sherlene Chamberlain of the Eagle Commission, in a recent visit with Chaplain David Mvondo and his wife, Whitney, at Fort Gordon, Ga., home of the Army’s Signal Battalion. They went on to visit Chaplains John Jacobsen and his wife, Marlene, and Pete Stone and his wife, Monica, at Fort Hood, Tex. All three of these chaplains are new to roster of endorsed Fellowship of Grace Brethren chaplains in the U.S. Army, and all three are scheduled to deploy to Iraq. David Mvondo was raised in the Cameroon and came to know the Lord as a student in a Grace Brethren Bible college established by former missionary Don Hocking. David attended seminary in the U.S. and secured a slot in the U.S. Army Reserves as a chaplain. He spent a one-year tour in Iraq and was then accepted into Active Duty upon his return to the states, gaining U.S. citizenship in the process. He met Whitney during seminary and they are the proud parents of a beautiful three-year-old, Mbia. At Fort Hood, Chaplains Jacobsen and Stone are assigned to the First Air Cavalry Division of III Corps at a post that comprises over 340 square miles, including a massive air base that houses Apache and Chinook helicopters. With the multiple deployments troops are enduring, the strain on family relationships is severe. Many of the counseling sessions with troops are related to marital stress. John and Pete are new to the chaplaincy, recently completing chaplaincy school together at Fort Jackson. It’s a very steep learning curve, and they are deploying to Iraq in April. Please pray for these fine servants of Christ . . . that God will bless their ministries and keep them safe throughout their coming deployments. Pray, as well, and just as earnestly, for their families left behind here in the states. 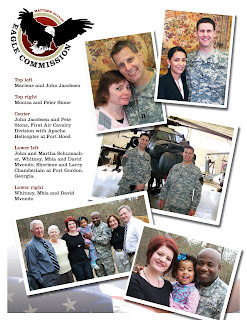 The Eagle Commission provides support and encouragement throughout the year for Grace Brethren Chaplains, their families, and the brave men and women in the U.S. Armed Forces who wear our nation’s uniform, often in harm’s way.